Monday morning I got a call saying there is a major invasion in Nablus because soldiers had uncovered an explosives laboratory. 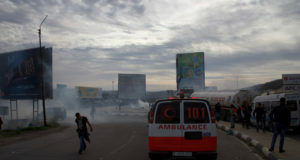 The entire city was under curfew, and ISM needed volunteers to go there and help the medical teams. Of course, sure, I had a day off so why not spend it tramping through the wet, muddy streets of Nablus with the UPMRC (the Union of Palestinian Medical Relief Committees) Sounds like a party to me. Before leaving we learned that soldiers had taken over the local TV station and were broadcasting the names of eight men they wanted either dead or alive and that the operation would last until the men were found. Hmm, so they want to kill or arrest eight men and so the entire city is shut down, everyone is ordered to remain in doors while the soldiers rampage through the city, occupy homes and schools and continue the general harassment that is jading me to the point where things that seemed worthy of writing home about are brushed off and no longer given a second thought anymore. That is bad. The road from Ramallah to Nablus is beautiful in the spring. The almond trees are blooming, there are fields of yellow and purple flowers and my favorite flower, the striking red poppy. After arriving in Nablus, our team of four international volunteers met up with a group of PMRC volunteers and began the somewhat harrowing job of breaking curfew in order to check on sick people and bring medicine and food. I’ve never walked around a city under curfew before. It looked like a ghost town except for a few stragglers and teenaged boys who were provoking and teasing the teenaged soldiers. Ridiculous. Is any of this worth dying for ? I don’t think so, I wonder if the soldiers do. Then comes the existential questions, what am I doing here, is it helping ? Why bother… Even when the occupation has ended, the strife will move to another part of the world. Who is to say the Palestinians won’t turn their collective devastation onto another population like the Israelis have done to them and the cycle will continue ? The world is such a bad place now. I feel helpless. Nevertheless we followed the UPMRC teams with our hands up shouting “MEDICAL RELIEF, WE ARE UNARMED, DON’T SHOOT” whenever we encountered soldiers. There’s nothing like staring down the barrel of a gun to pull you out of bouts of self-pity. It’s ironic how the unarmed UPMRC guys seemed so much less frightened than the jumpy soldiers who were armed to the teeth. Fear is a funny thing. I guess they’re used to it; it’s their city; it’s normal life for them. We helped them bring food and medicine to people who had called in with requests because the soldiers are less jumpy and violent when they see a group of international girls breaking curfew. At one point a group of eight soldiers walked passed us, guns aimed in every direction, accompanied by an older Palestinian man. I couldn’t figure out what the Palestinian man was doing with them because he didn’t appear to be under arrest. I asked one of the PMRC volunteers who explained to me that the man had whispered to him that he was a human shield. He’d been “kidnapped” since 4am that morning and was forced to accompany the soldiers as they patrolled the streets so that Palestinian fighters would not shoot at the soldiers. You know this happens, you read about it but nothing prepares you for the shock and disgust of actually seeing it yourself. We made some phone calls to Israeli human rights organizations. The Fourth Geneva Convention prohibits the use of civilians as human shields in military operations. At this point I start to wonder if anyone cares if a father of five who sells vegetables in the market during the day is being used as a human shield in a military operation. As it began to get dark we found a hotel to stay at and the UPMRC guys helped us locate what seemed to be the only open grocery store in all of Nablus. 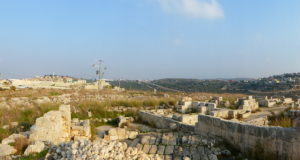 The following morning I left back to Ramallah. The beautiful ride back is kind of like the payment you get for the devastating way being in Nablus makes you feel. As I’m writing this report I heard of the first casualty of the invasion. A 50 year man was shot in the back of the neck while walking down the street with his son. Why do we even associate with these people. Wall them in, expel them, and import thai laborers. END OF STORY. We need to be COMPLETELY seperate from murderous barbarians. Isn’t this what’s already happening? 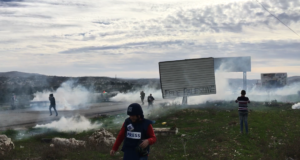 Once again, a non-violent, Palestinian-lead demonstration was met with Israeli Police violence.